Municipal water treatment engineers and technicians will find that the advanced GF90 Mass Flow Meter from Fluid Components International offers superior performance in gas measurement applications, such as chlorinated water disinfection systems, with less maintenance and lower installation and operating costs. In a typical large urban municipal water plant, an automation system controls the flow of liquid chlorine through a pipeline to a chlorination system. The liquid chlorine is circulated through an evaporator that boils it and the gaseous vapor is drawn off. The chlorine gas is then added to the water in precise and accurate concentration levels as measured by a gas flow meter such as FCI’s GF90 Flow Meter to ensure high quality and safe potable water. The automation system continuously monitors the quality of incoming water from its supply network to determine the correct amount of chlorine necessary to maintain the required water purity. The FCI GF90 mass gas flow meter is inserted in the chlorine gas process piping and its 4-20 mA output wired to the input/output (I/O) modules in the automation system. The automation system then continuously measures and controls the amount of chlorine to be dispensed for optimum water purity. 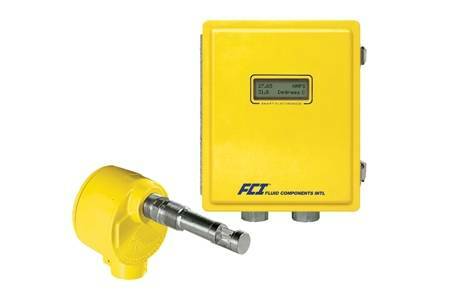 FCI’s GF90 Flow Meter alleviates several problems associated with metering chlorine gas. Chlorine gas is wet, corrosive, and flow rates can be extremely low, which makes accurate measurement difficult. With its solid-state precision flow sensor design, the GF90 reduces the problem of plugging that can occur with small-bore orifice design sensors such as differential pressure devices. As a solid-state meter, the GF90 can measure extremely low flow rates and it is a simple process to construct the sensor of materials that make it impervious to this highly corrosive, wet chlorine gas. Materials of construction for wetted parts include Hastelloy-C as an option. The GF90 Flow Meter’s constant power technology results in a stable output with high accuracy of +1 percent of reading plus 0.5 percent of full scale, with repeatability of +0.5 percent of reading or better. The GF90 is designed to measure a wide range of air/gas flows, 0.08 to 487.7 NMPS (m/sec at a normal temperature of 21.1ºC and pressure of 1.013 bar absolute), with a turndown ratio up to 1000:1. It is available for service in a broad range of fluid temperature applications, from -73 to 454ºC and pressure applications to 69 bar (g). The GF90 Flow Meter is designed for multi-gas or variable flow processes and it includes an advanced microprocessor-based programmable transmitter that can store up to three gas calibration groups. Each group can be manually or automatically switched for a specific gas calibration to provide accuracy in complicated processes where gas mix percentages can change due to specific flow conditions. The instrument also measures both mass flow and temperature. The user can address the GF90’s transmitter electronics either via a built-in LCD display and keypad or through its RS-232C serial port. Functions include in-field programming to change zero, span, switch points and engineering units, or access to perform calibration verification, troubleshooting and other diagnostic functions. The serial port supports access to other electronic devices. The GF90’s transmitter features dual alarm switch points with alarm relay outputs. It also offers two independent, field programmable analog signal outputs of 4-20 mA, 0-10 Vdc, 0-5 Vdc, and/or 1-5 Vdc, which can be assigned to any combination of flow and/or temperature. The switch points are user field-programmable to alarm at high, low or windowed settings and are assigned to both flow and temperature measurements.